Markets InsiderSnap’s stock hit a record low Wednesday morning. 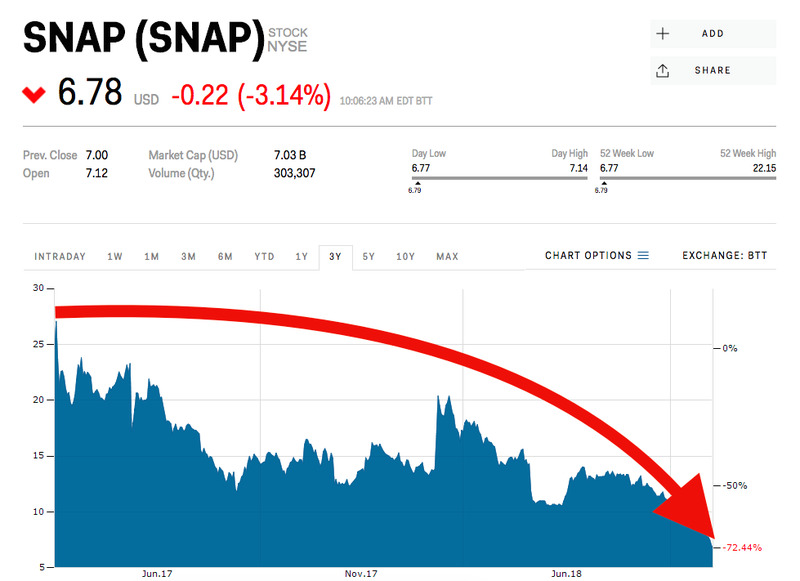 Snap shares have been hammered this year, hitting a record low on Wednesday. Watch Snap trade here in real time. Even Snap’s launch of its new scripted shows, called “Snap Originals,” isn’t helping lift its share price, which hit a fresh record low Wednesday morning. After briefly jumping 2% in premarket trading following the announcement, shares slid into the red as the market opened, touching a new low of $US6.80 apiece. Snap’s stock has been hammered this year as the company’s photo-sharing app struggles to keep pace with Facebook’s Instagram. Earlier this year, Instagram said more than 400 million people use its Stories feature, which is almost double that of Snap’s daily active users. After releasing its controversial app design in February, the company reported daily active users fell for the first time on record during the second quarter..
To lure back users, the company has signed new partnerships with several Hollywood production houses including Bunim/Murray Productions, the Duplass Brothers’ DBP Doughnut, and Brad Weston’s Makeready for its “Snap Originals” series, the release said. In addition, it also renewed its content production commitments with Viacom for creating 10 new Snap Originals and NBCUniversal through 2019. According to the company release, since the beginning of the year, the company has nearly tripled the time viewers spend engaging with its shows. Last week, CEO Evan Spiegel sent a 6500-word internal memo, where he admitted that the company “rushed” with its redesign, and explained how the company plans to reach profitability next year by expanding in new markets like India, Indonesia, Mexico, and Brazil. But analysts are still sceptical about the company’s goal to be profitable by next year. Evercore ISI analyst Anthony DiClemente said last week the company would lose 1 million daily active users in the third quarter and slashed his price target to $US7 per share from $US9. Snap shares were down 52.4% this year through Tuesday.